Rpt Pattern Row until eleven 2dc group rows have been worked from yoke. Fasten off. Turn. 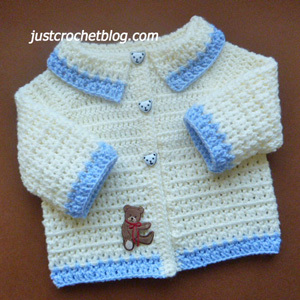 Join in color 2 and rpt Pattern Row twice. Fasten off. Row Three – ch3, work 1dc in space between ch3 and first dc, * skip 2dc, work 2dc in space between the next 2dc’s, * rpt from * to * to end, skip 1dc, sl st to top of ch3 on beginning of row. Turn. Row Four – ch3, skip 1dc, * work 2dc in space between the next 2dc’s, skip 2dc, * rpt from * to * to end, work 1dc in space between last dc and ch3, sl st to top of ch3 on beginning of row. Turn. Rpt Rows Three & Four three more times. Fasten off. Turn. Join in color 2 and rpt Rows Three & Four once. Fasten off. Button/Buttonhole Bands – Starting at lower edge on right hand front, with RS facing, ch1, work 45sc evenly up front edge to corner. Turn. Buttonhole Row – ch1, 1sc in base of ch1, * ch2, skip 1sc, 1sc in each of next 9sc, * rpt from * to * once, ch2, skip 1sc, 1sc in each sc to end. Turn. Next Row – ch1, 1sc in base of ch1, 1sc in each sc and ch2 space to end. Fasten off. 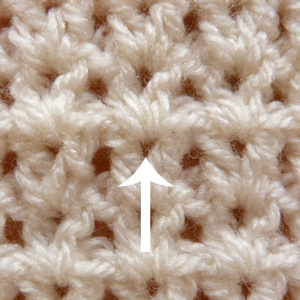 Button Band – Join color 1 to neck edge on left hand side, ch1, work 45sc evenly along to corner. Turn. Starting with ch1, 1sc in base of ch1 and turning at the end of each row, work 2 rows of 1sc in each sc to end. Fasten off. Rpt Pattern Row from skirt once. Fasten off. Turn. Join in color 2 and rpt Pattern Row from skirt twice. Fasten off. 7th Row – ch3, 1dc in each dc to end, sl st to top of ch3 on beginning of row. Rpt last row 6 more times, making 13 rows in all from beginning. Fasten off. Next Row – ch3, work 1dc in space between ch3 and first dc, * skip 2dc, work 2dc in space between the next 2dc’s, * rpt from * to * to end, sl st to top of ch3 on beginning of row. Turn. Pattern Row One – ch3, skip 1dc, * work 2dc in space between the next 2dc’s, skip 2dc, * rpt from * to * to end, 1dc in space between next dc and ch3, sl st to top of ch3 on beginning of row. Turn. Pattern Row Two – ch3, work 1dc in space between ch3 and first dc, * skip 2dc, work 2dc in space between the next 2dc’s, * rpt from * to * to end, work 1dc between last dc and ch3, sl st to top of ch3 on beginning of row. Fasten off. 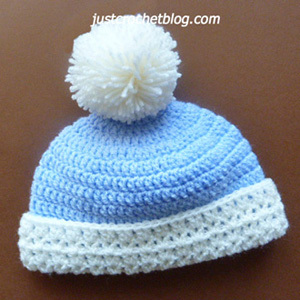 Finishing – Close small gaps under arms, weave in and trim off all loose ends of yarn, sew on buttons to correspond with buttonholes on coat, attach pom-pom to crown of hat. 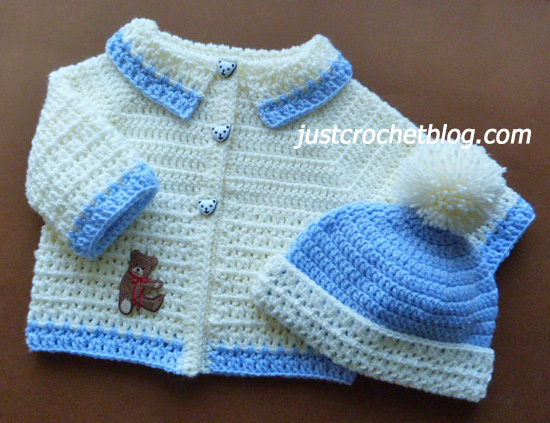 Hope you enjoy this free crochet coat-bobble hat pattern, don’t forget to pin!